Not having zoomer with me was a mistake. I know that now. One morning while gazing out the window in the direction of trellis (aka "the baseball scoreboard") and our old wood bench, I noticed movement of some sort. Sure enough, something was down there busily tossing wood chips through the air. 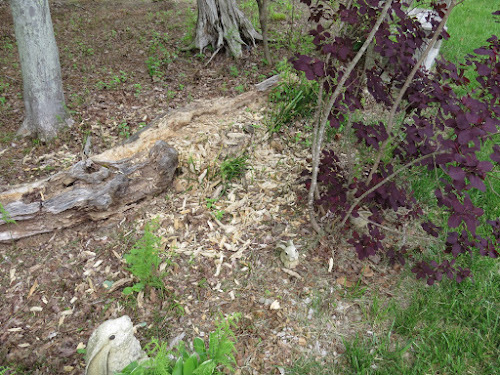 Having been there since we moved in, the old tree trunk, aging and deteriorating at its own pace, had become part of the landscape. Although the Pres had asked me frequently if I wanted him to remove it, I thought it made a nice backdrop for the Daffodils and Tet-a-Tet's in the Spring. Beside, my rabbits looked so cute gathered around it once the ferns opened. So, as I was saying, all was well with the old decrepit log until the other day. 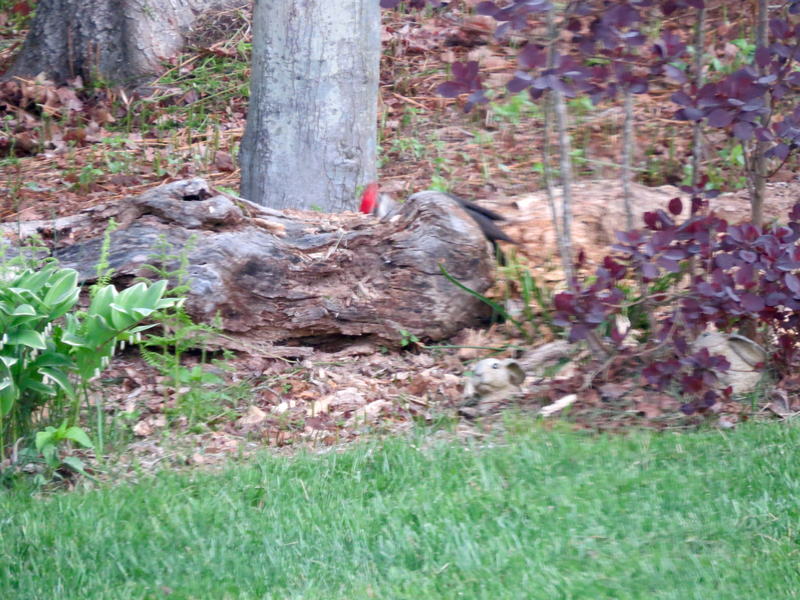 The resident Pileated Woodpecker must have sensed a good meal in it because when I looked out the window, there it was making wood chips! Chipping away like mad, it never even stopped to look at me other than this one shot. Wood chips were literally flying everywhere!! 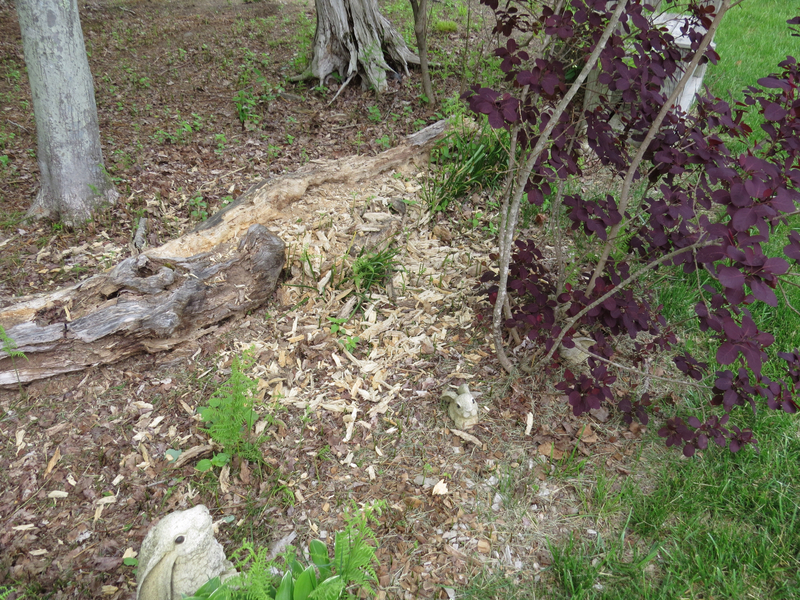 What was once an rather distinguished looking, aging tree trunk was turned into this in mere minutes. So, while many people rent wood chippers from their local hardware store, we are fortunate to have one that lives close by...right here in the woods. You did know that leaving logs of this sort make lots of critters happy, right? Hello, those are the kind of wood chippers I like. Great sighting of the Pileated Woodie. Have a happy day and week ahead! 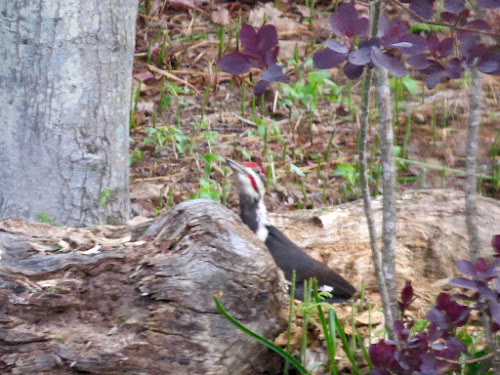 Great pictures of the woodpecker! Beautiful looking bird! A hard-working critter to help you out. Awwww...this is a precious post! What a cutie he is. We had a woodpecker for years outside our bedroom window. I could barely hear it with my deafness but hubby could. I tried so hard to get a glimpse but that oak scraped the skies. JP, That little wood chipper was very busy. He must have an amazing beak to make chips of a log like that. I understand the log had been there some time but it's kind of mind blowing how he just made chips of most of it. Hunger is a motivator. Thanks for sharing Sylvia D.
That woodpecker sure made short work of that wood. 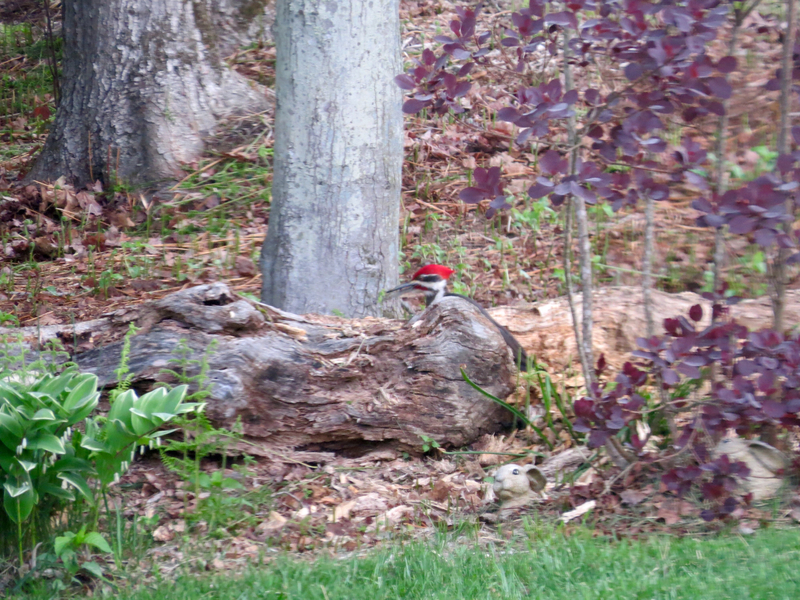 I'll take a Pileated woodchipper any day! Thanks for sharing! What a lovely sight! Beautiful wood chipper! Amazing what we can see when we pay attention.